I don’t know about anybody else, but I’d want to return to my high school years about as much as I’d want to see the IRS on my caller ID. Those years are tough on all of us, a time for our rapidly growing ideas and minds to catch up with our rapidly growing body parts, a time to figure out who you are. My path through those hormonal years was rarely clear of debris and thorny sticks, and I always watched with a little bit of envy those whose path seemed clearer and more focused than mine. Amal is one of those people. She’s a typical teenager in her Melbourne prep school. She’s on the debate team, has a close circle of girlfriends, is concerned about her clothes matching and whether she has a zit, and most importantly, if the cutest boy she’s had a crush on for ages is noticing her. But there’s one thing that’s not so typical, she’s a Palestinian-Muslim, the only one in her school and this year she’s decided to wear her head scarf (hijab) full time as a statement of her faith. It’s 2002, a year after the September 11th attacks and a few months away from the Bali explosion in Indonesia. Tensions against Muslims are running high everywhere, in her school, her neighborhood, and in her city. Yet, Amal is a strong young woman who has come to the decision to stand up for what she believes in, despite the obstacles, and in the end they only seem to increase her resolve to stick with what she believes in. What’s not to like about a story about a young teen who clearly knows what she wants? For someone who knows nothing about the Muslim religion, I found what was discussed here a light taste of something infinite. 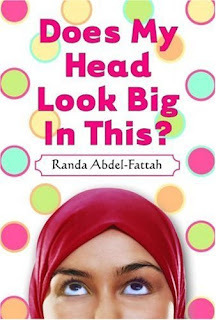 The author was clearly trying to explain to non-Muslims that Muslims are just like everybody else, through Amal’s interactions with her parents, her extended family and her friends, but I might’ve liked seeing a deeper look, like why Muslim women wear the hijab in the first place. Not all Muslims are terrorists, I get it. The majority of them are peace loving people trying to do the best for their families. This was probably the main point of the book, over and over and over again. Therein lies my problem with this story. Think peachy with an r conveniently situated. The plot was so well calculated it didn’t flow naturally for me. It didn’t seem realistic at all, from her relationship to her parents, to her experiences with prejudice, and especially her discussions with her friends. In college maybe, but 11th grade? Really? What planet is she from? Maturatron. (I wonder if they wore leg warmers there too?) Oh, why couldn’t I have been from there as a teen! Kudos to you, Ms. Abdel-Fattah, for creating a strong female lead for other teens to look up to, but next time ease up a bit on the moral lessons as it sometimes makes a teen, er…an adult like me rebel and give you a 2.5 stars. Sorry. For some reason, while reading through this review, I was thinking this was a memoire of the author's teenage years. I tend to pay little attention to character names and such...otherwise I probably would have realized it was different. Whoops. Anyway, sorry to hear it kinda sucked. It sounds like an interesting premise. I hate it when books get all preachy though. I might have to take a look at this one though just to see how it goes. You've piqued my curiosity. I believe the author is also an Australian Palestinian-Muslim so she must've taken alot from her own life. It did seem autobiographical at times, just thin on plot. I didn't think the main character changed much over the course of the book. She started strong, and ended strong, with some fluff inbetween. Reading about another religion was interesting though, especially since the author obviously had experience with that sort of thing. That part I liked. I've read a lot of books on Muslim customs and culture, but mostly from the Middle East and West Asia (Afghanistan, Pakistan, etc). I haven't read much about the Muslim world outside that area. I wonder how different the customs and such are. I know the religion itself isn't different, necessarily, but people always adapt things in different ways. "But there’s one thing that’s not so typical, she’s a Palestinian-Muslim, the only one in her school and this year she’s decided to wear her head scarf (hijab) full time as a statement of her faith. "okay, i'm going to get slammed, but i have a real problem (in the real world) with this. just who is the object of this "statement of faith"? the infidel Australians? sorry, Amal, but you're living in their country. to Allah? doesn't He know your heart already? do you need to prove something to Him? to yourself? okay, fine. but wear it in the privacy of your own home. the rest of Australia isn't interested. folks, if i moved to Saudi Arabia, i sure wouldn't carry a big Bible with me everywhere i go as a "statement of faith". i'm in a Muslim country now. i'm going to try and blend in as best i can. and failing that, i'll at least try not to flaunt my "foreign" religion in the faces of the natives. i like the way France deals with this. no veils allowed in schools, period. yeah i know, in this book it's a scarf, not a veil. but the principle's the same. if you've moved to a new country, why aren't you trying to assimilate yourself? okay, let the slamming commence. I won't slam you, but I don't agree, either. I don't know about making a statement, but the hijib is worn as a religious mark, for specific religious reasons. The same as a Mormon wearing their temple garments, only those happen to be under the clothes. If the girl in the story just wanted to prove something, I can see that being a problem, but if they were just following the tenants of their religion, which involves taking on the veil as you reach adulthood (people seem to vary a bit about when this is), I don't have a problem with that. That's what religious freedom is for. In Saudi, it's a little different because there isnt' religious freedom. You HAVE to wear the scarf if you're a woman, no matter your religion. But I don't have a problem with people wearing religious or cultural garments in the free world. on the street, yes. in her home, yes. in a public school, no. if that compromises her religious beliefs, she's living in the wrong country. Why not in a public school? As long as she's not preaching or advertising religion, I see no problem with her wearing clothes that are appropriate for her religion to school. I don't believe the state should try to control religion any more than religion should try to control the state. If she was disrupting class by praying a couple times during the day, yeah, that's not good, but just dressing according to her standards of modesty, which includes covering her hair, why is that a problem? I don't think that just because one has a religious belief that extends to their everyday life, that they want to or ought to have to live under a theocracy. Do I agree with the Moslem? No more than I do with the Christian faith, no. But I grew up with girls who wore a cross around their neck to school every day, and what's more, I knew people who expressed other beliefs - who wore army surplus green jackets to school, or who wore Jnco pants, or who wore wallets on chains. Enforcing a dress code beyond the barest of minimums is tantamount to censorship, as far as I'm concerned, and the ability to wear a headscarf is not the bare minimums. IT's so difficult to look for a sense of self as a teenager - why make it harder by proscribing right and wrong definitions of self? Jason, you make a good point. but if you replace the scarf with a veil, is it still okay? what about if you then replace the veil with a burkha? is there a line drawn somewhere, and if so, where? Ooo, a meaty conversation. I'm with Hamilcar on this one. Sort of. Where to draw the line? Good question. Anybody can claim anything in the name of religion. But, at the same time would people make that big of a deal if it was a Jewish hat or like Jason said, a cross, both of which advertise their religion as much as the hijab would. You're right, anyone can claim anything, but a headscarf isn't an idle claim. It's a well known tenant of Islam, and when it's just a headscarf, it's not obtrusive, it doesn't affect one's ability to receive instruction at school (or anyone else's), and it doesn't hurt anyone. I can see drawing a line at a veil or burka, because it would interfere with what the school is doing. But a headscarf? I mean, if a high school girl had chemotherapy and lost her hair, would a school object to her covering her hair with a bandana? Not likely. So why object to Muslim women covering their hair? It's a public school. Terry, you say "on the street, yes. in her home, yes." Why is public school any different than a public street? It's PUBLIC. Okay, if a private school doesn't allow headscarves, whatever, they certainly have that right. But a public school should not impose on religious beliefs unless they conflict with the ability for the student or other students to learn. "And it harm none, do what ye will." Doesn't hurt me if someone wears a burqha to school. I am glad to live somewhere where someone can wear a burqha to school and sit next to someone who wears a rosary, and have a teacher who is a seventh day adventist, and have another student who thinks God is a load of crap.